Saturday February 28, 2009 from 2:00 – 4:00pm at the Alexandria Bahá’í Center (5400B Eisenhower Ave, Alexandria VA) there will be a celebration. There will be presentations by children’s classes, music, games, service activities, cake & ice cream and more! Saturday February 28, 2009 at 6:30pm the Arlington Bahá’í Community will be sponsoring an Ayyám-i-Há dinner party. This will take place in Crystal City, dinner will be provided, and there will be music and time for socializing. We wish you a very happy Ayyám-i-Há and hope that you will join us at one or both of these celebrations. For more information please contact us. Please join us for our monthly prayer meeting on Monday, February 23. In times like this, when our Bahá’í sisters and brothers in the cradle of the Faith are imprisoned and awaiting what promises to be an unfair trial, let us get together and pray for their speedy release. Please join us for interfaith devotions, prayers, music, fellowship, cake and tea on Monday, February 23rd at 7:00 pm. The building is metro-accessible via the Orange line, between the Virginia Square and Ballston stations, and is right across from Arlington Central Library. 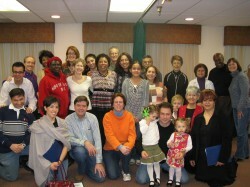 Please contact the Baha’is of Arlington and find out more about this devotional gathering. As Iran continues its practice of denying human rights to millions of its citizens … students, women, journalists, bloggers, and religious minorities … the situation in Iran has turned dangerous for the Bahá’í community, the largest religious minority in Iran. 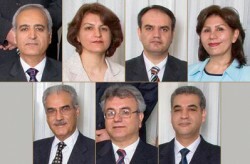 The deputy Tehran prosecutor has announced that seven imprisoned Bahá’í leaders (seen in the photo) will be going on trial the week of February 15 on completely trumped-up charges, including propaganda against the Islamic republic and espionage for Israel, a capital offense in Iran. The Nobel Laureate, Shirin Ebadi, is their lawyer, but has been prevented from meeting with the Bahá’í leaders and from having access to their files. Hold your own prayer gatherings for the safety of the Friends in Iran. Organize prayer gatherings in your community, in consultation with your Local Spiritual Assembly, as soon as possible for the safety of the Iranian Bahá’í leaders and for the amelioration of the deplorable situation of religious freedom in Iran. These gatherings should be open to the public and the members of your local media should be invited. Reach out to your Christian, Jewish and Muslim friends, and to your interfaith groups, as well as to all those concerned about religious freedom in Iran. The main purpose of such gatherings is for prayer, and it is essential that they should uphold and exemplify the Bahá’í standard of non-involvement in partisan politics. Discussion on matters outside the scope of religious freedom and human rights should be strictly avoided. 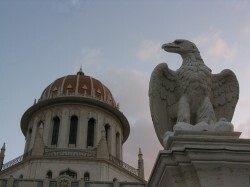 Timely updates are online at the official blog, Persecution of Bahá’í’s in Iran, including links to government statements and media coverage. ¡Ud está invitado a una reunión devocionál! – se degusta de las orillas del maravilloso océano de la gracia infinita de Dios. Usted está invitado a una reúnion devocionál sábado el 21 de febrero a las 7:30 por la tarde en Crystal City. 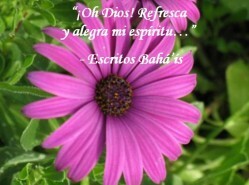 Vamos a leer oraciones de varias religiones y si quieren, pueden traer oraciones, citas or poemas para compartir. Vamos a reunir en una hogar dos cuadras del metro. Si necesites más información, o tiene cualquier pregunta, por favor contactanos. ¡Espero que pueda acompañarnos y honrarnos con su presencia!